Geysers and glaciers, sweeping beaches and dramatic fjords, rugged mountains, primeval forests and deep blue lakes. The scenery in New Zealand is truly majestic and clearly its chief tourist draw. 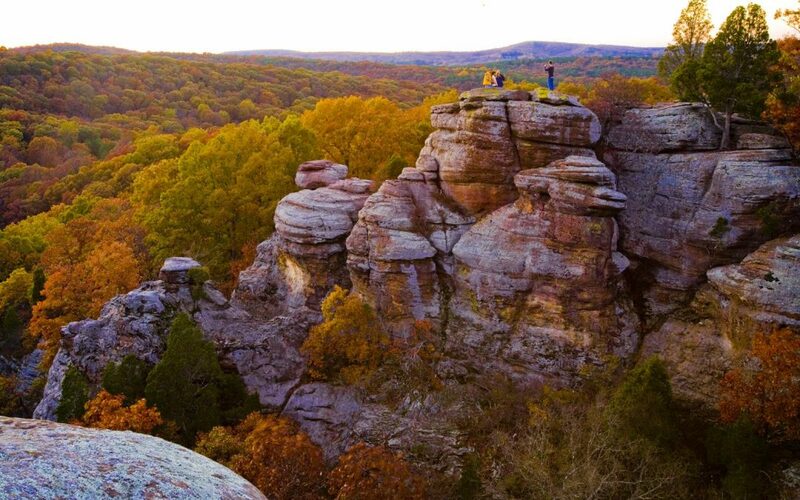 Whether you’re an active type or strictly a sightseer, the country offers plenty to fill your days. No use in trying to see it all in one trip—you’ll just have to come back. Year after year, New Zealand ranks among the top 10 places that travelers would like to visit. Its quality of life and reputation as an outdoor playground attract Americans hungering for new places to explore—and willing to travel a long distance. New Zealand, indeed, is one of the most isolated countries in the world. San Francisco is 6,200 miles away, and Australia lies 990 miles to the west. About the size of Japan or the British Isles, New Zealand comprises two large islands and a number of smaller ones, stretching some 1,000 miles long from north to south. Fourteen miles separate the main North and South islands. 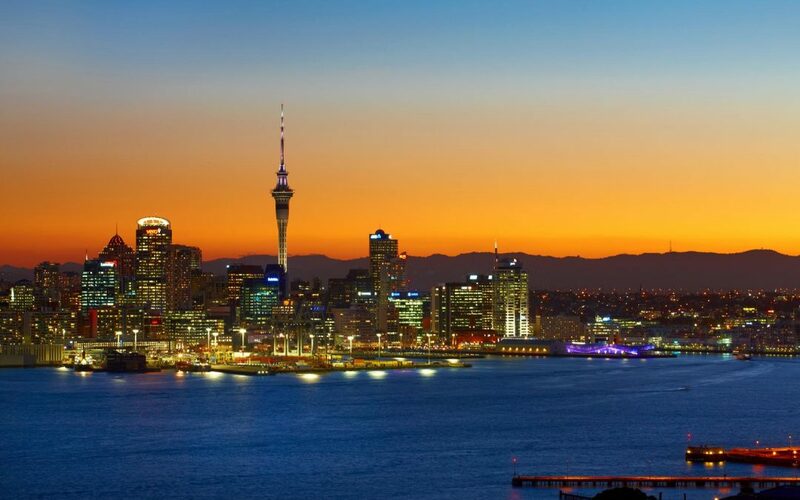 Your trip most likely will start on North Island with arrival in Auckland, the country’s largest city and home to one-third of its 4.8 million people. Framed by two natural harbors, the “City of Sails” boasts more yachts per capita than any other place in the world. For a good introduction, take a 90-minute harbor cruise with Fuller’s Ferries or head to the observation deck of 1,082foot Sky Tower for panoramic views. 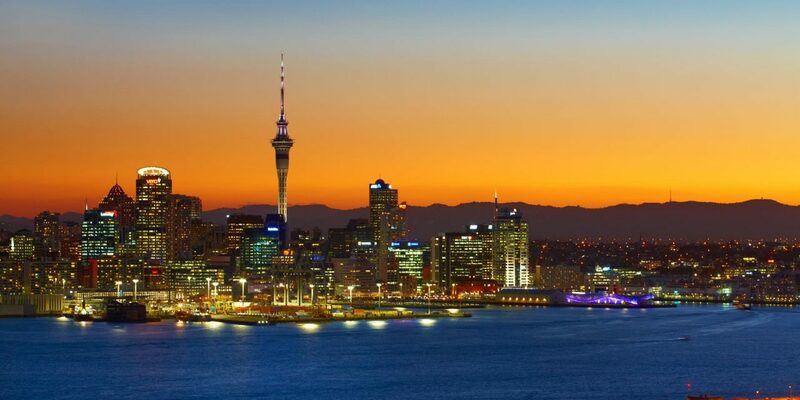 Auckland’s vibrant arts and dining scene reflects the best in New Zealand urban life. For antique shops, designer boutiques and smart cafes, check out charming Parnell Village with its historic, white-and-pink timber facades saved from the wrecking ball. 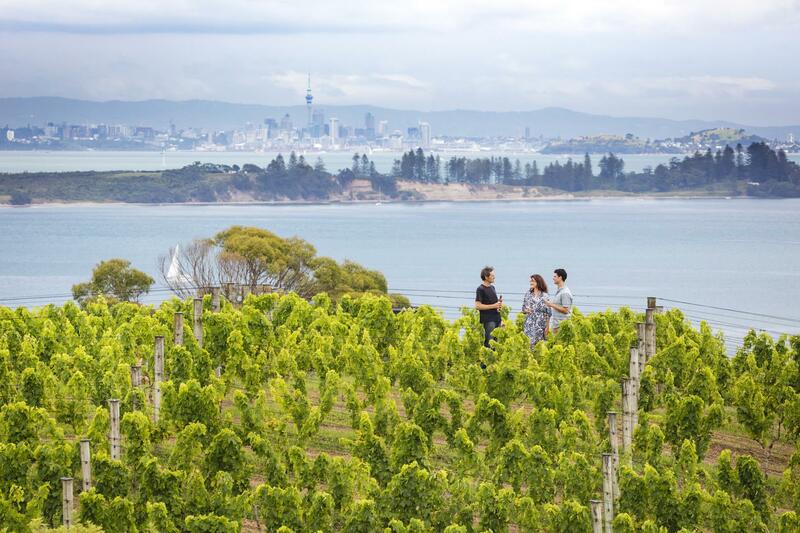 Or take a ferry to Waiheke Island, a magical blend of vineyards, olive groves, beaches and art studios. Do some wine tasting at the vineyards or enjoy vintages unavailable on the mainland at the island’s cafes and restaurants. In Auckland Domain, a park built atop an extinct volcano, the Auckland War Memorial Museum features an excellent collection of Maori and Pacific artifacts. Maori song and dance performances are held several times a day. (The Maori, a Pacific people who arrived in New Zealand about 1,000 years ago, account for 15 percent of the nation’s population.) The country’s rich seafaring history is told at the harborfront’s Voyager New Zealand Maritime Museum; highlights include Pacific and Maori seagoing canoes, European sailing boats and exhibits on early whaling. 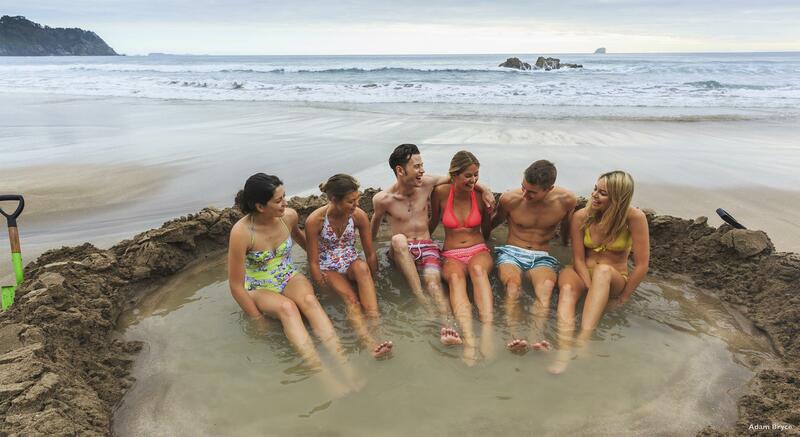 At Hot Water Beach on the Coromandel Peninsula, east of Auckland, visitors can create their own Jacuzzi in the wet sand during low tide. With a rental spade from the nearby shop, anyone can build a private hot pool by scooping out a shallow hole. The deeper you dig into this thermal oddity, the hotter the water becomes. 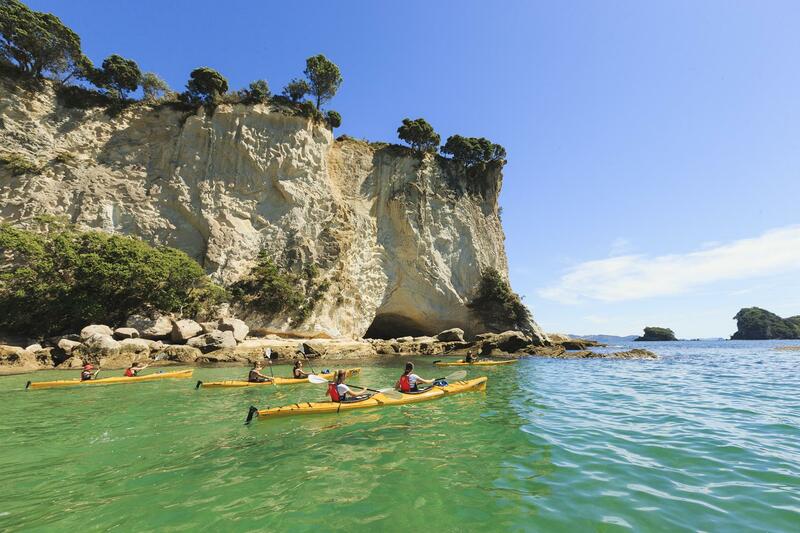 The peninsula’s Cathedral Cove rock arch and white-sand beach, lapped by gorgeous blue waters, are destinations for hikers and can be reached by water taxi and kayak as well. Rent a spade from the local surf club, dig yourself a hole in the sand and indulge in the warmth at Hot Water Beach. The city of Rotorua and surrounding area, a four-hour drive south of Auckland, encompass a volcanic zone of geysers, boiling mud pools and huge craters, a land where nature’s forces escape by bubbling, steaming and hissing from the inner earth. Rotorua has been a center for spa tourism since the late 19th century, and many places, such as the Polynesian Spa, offer a variety of mineral baths, from large communal pools to private baths for two. The lush farmland of Rotorua is the heart of New Zealand’s Maori culture and the setting for The Lord of the Rings and The Hobbit movies. At Rotorua’s Living Thermal Village, visitors see how Maori residents cook using natural steam vents and where they bathe in hot pools. Guided tours of Te Puia, another Maori community, include Pohutu Geyser, the largest active geyser in the Southern Hemisphere. Both villages offer a Maori cultural performance, traditional ceremonial feast (hangi) cooked in an earth oven, and Maori arts and crafts for sale. You might be able to spot one of New Zealand’s national birds at Te Puia’s Nocturnal Kiwi House. Just north of Rotorua, you can learn about one of the country’s major exports— wool—at Agrodome, a working sheep and cattle ranch bordering Lake Rotorua. New Zealand, in fact, is the world’s leading wool producer. A ranch visit entails a show with a sheep-shearing demonstration and trained dogs working with sheep. You’ll also see a kiwifruit orchard. Extreme experiences at the Agrodome complex include bungy jumping. More extreme fun awaits atop Mount Ngongotaha, where Skyline Skyrides’ cable car delivers you to a lookout with spectacular views of Lake Rotorua. The daring will take a seat in the Sky Swing, a giant three-person swing that reaches speeds of over 90 mph, or go careening down the mountain through redwood trees on the luge track. 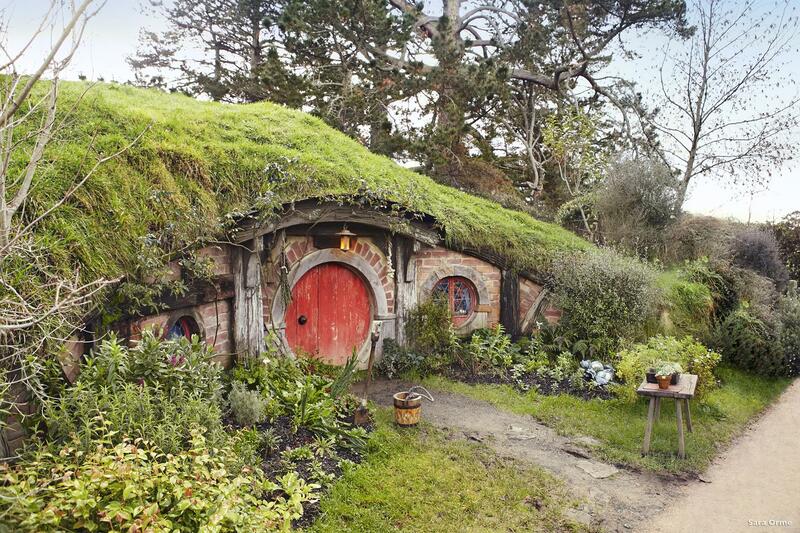 New Zealand director Sir Peter Jackson put his country on the map by showcasing its otherworldly scenery in the Lord of the Rings and Hobbit trilogies. 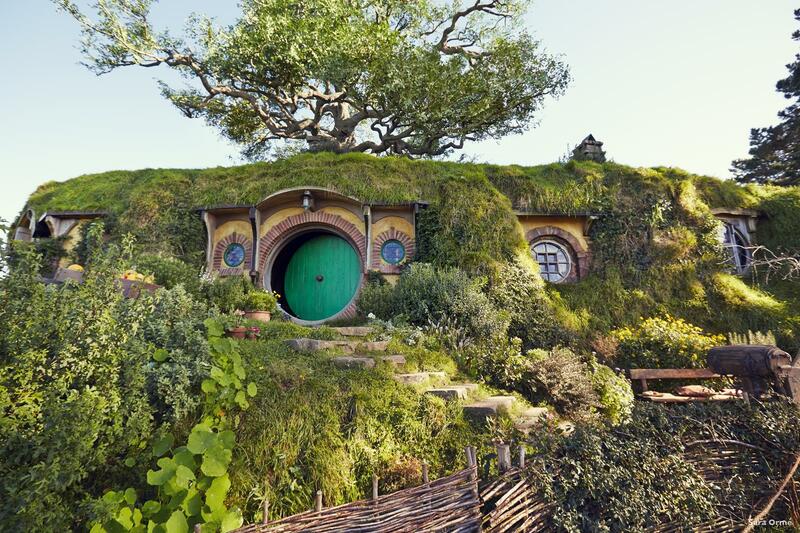 Just outside the town of Matamata, travelers can experience the real Middle Earth on a tour of the movie set, a 12-acre site used as The Shire and village of Hobbiton in Jackson’s Oscar-winning films. The North Island also abounds with underground wonders, and the Waitomo cave system is one of its visitor magnets. Sightseers can choose from walking tours and boat cruises, while the more adventurous can go tubing, rafting, rappelling, swimming and rafting in the surreal limestone chambers. One boat trip ventures into a grotto with a “starry” ceiling lit by thousands of twinkling glow worms. Wellington, the capital of New Zealand, sits at the south end of the North Island and is the jumping-off point for the scenic ferry journey across Cook Strait to the South Island; dolphins are frequent traveling companions of the ferry. 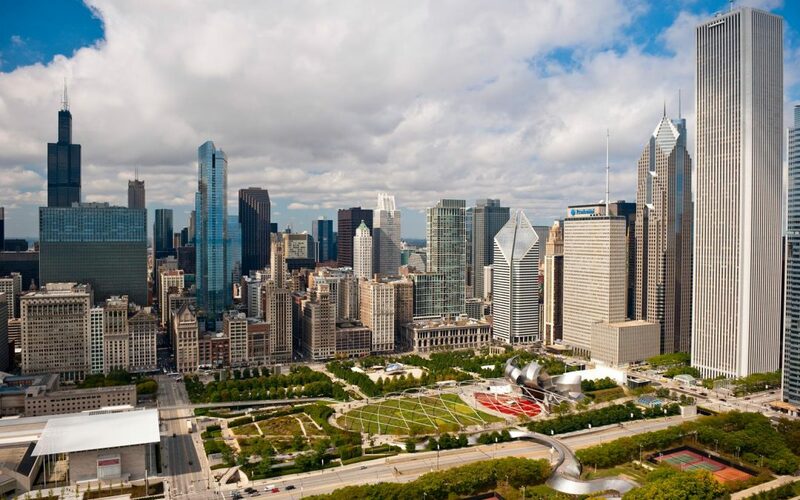 The compact, highly walkable city boasts world-class restaurants and a prominent arts profile. For great views, ride the Swissbuilt cable car that goes to the suburb of Kelburn. The culture-minded will want to visit the Museum of New Zealand Te Papa Tongarewa, a top Wellington attraction. One of the most memorable experiences on the South Island is whale-watching off Kaikoura, where sperm whales feed closer to shore than any other place in the world. 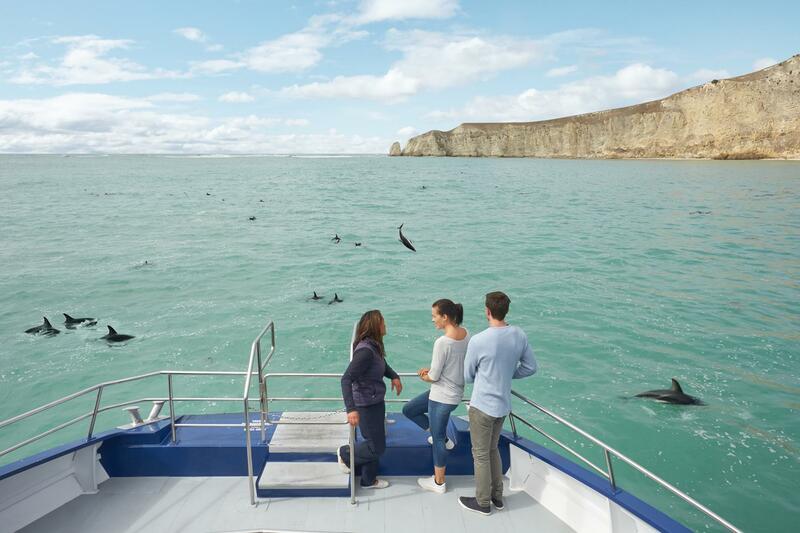 Located two hours north of Christchurch, the rugged coastline between the Pacific Ocean and snow-capped peaks of the Southern Alps provides a magnificent backdrop for up-close observation of not only diving and breaching whales but Dusky dolphins and fur seals as well. Besides sperm whales, which inhabit the area year-round, you also may see migrating humpback, pilot or orca varieties. Several local operators offer outings that involve swimming and snorkeling with dolphins and seals. 19 other peaks that rise more than 10,000 feet. Scenic drives near Mount Cook are highlighted by two glacier lakes—Tekapo and Pukaki—in brilliant shades of turquoise. Queenstown, with the spectacular Southern Alps on its back doorstep, is the most popular tourist stop on the South Island and a hub for outdoor activities, from hiking, skiing and zip lining to bungy jumping, paragliding and whitewater rafting. 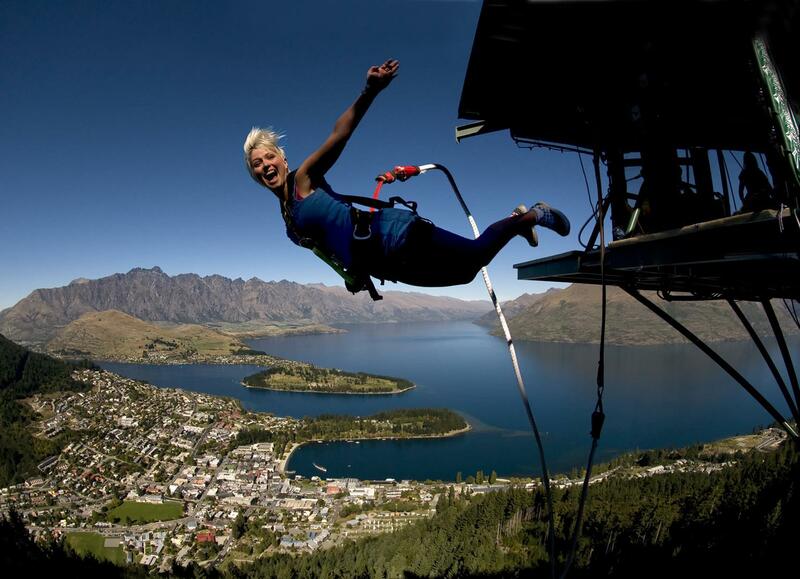 In fact, it’s been called the “Adventure Capital of the World.” Commercial bungy jumping started in New Zealand at a jump site near Kawarau Bridge, about 20 minutes from Queenstown. The not-so-brave will opt for the Skyline Gondola, which travels to the top of Bob’s Peak, a prime vantage point for taking in the splendor of Lake Wakatipu and watching paragliders jump off the summit and float down to lake level. A lake cruise on the 105-year-old TSS Earnslaw steamship to Walter Peak High Country Farm features a barbecue lunch and a sheep-shearing/farm dog demonstration. For an adrenaline rush, speed through the canyons of the Shotover River aboard the famous Shotover jet boat or dare to fly over the canyon on the Shotover Canyon Swing. 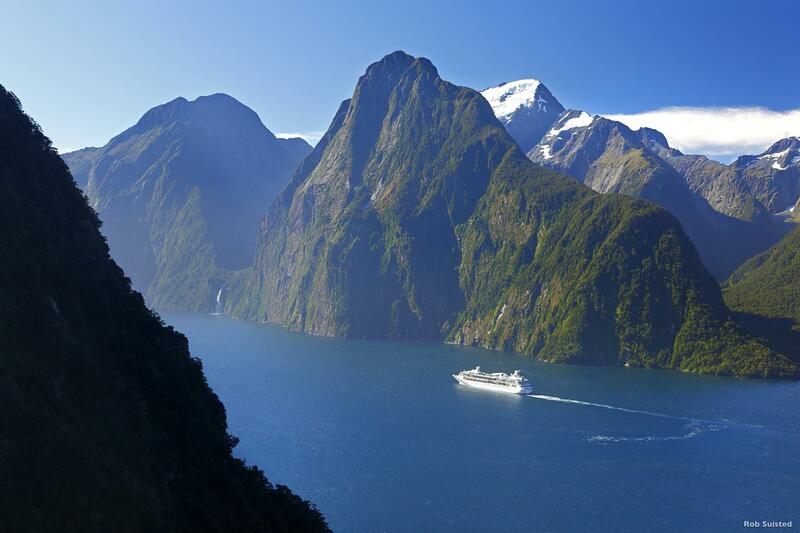 From Queenstown or Te Anau, a must-do experience awaits—a cruise around the fjords, waterfalls, rainforests, sheer cliff walls and snow-capped peaks of Milford Sound, the crown jewel of Fiordland National Park. 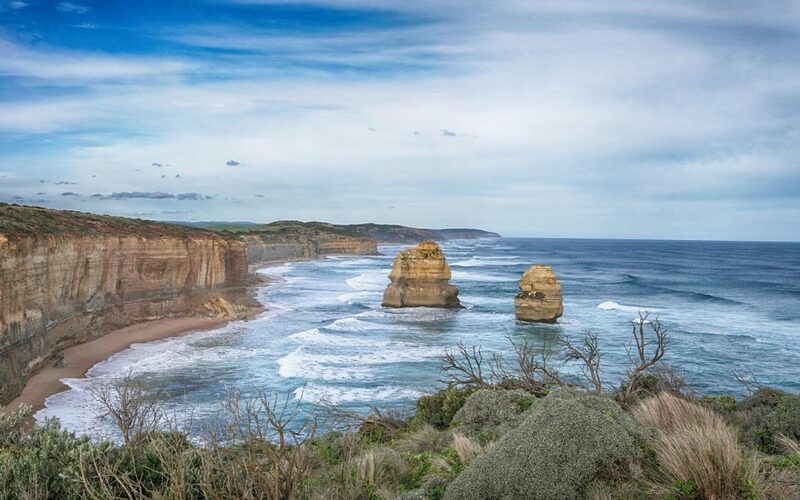 Dubbed the eighth wonder of the world by Rudyard Kipling, the sound is the home to seals, penguins and dolphins. You also can go kayaking on its glassy waters or fly over in a helicopter. Other options in the Queenstown and nearby Wanaka areas include vineyard visits in the world’s southernmost wine region, noted for its exceptional Pinot Noir. Most of the 90-plus wineries are clustered around Bannockburn, Gibbston Valley and Lowburn. Whether sipping palate-pleasing wines or drinking in eye-popping scenery, you and your group will find New Zealand to be a dream destination.